On 21st September 2018 it will have been a whole year since the landscaping of the gardens to the front of Alice House Hospice were completed, and the Wall of Light was switched on. To celebrate the wall and garden's 1st birthday we are offering a 20% discount on the full range of memory bricks within the Wall of Light. 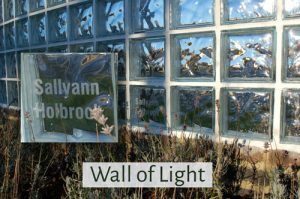 The Wall of Light is home to over 250 individual glass bricks and at night is bathed in a wonderful, warm glow of light. Set behind lavender beds which are awash with butterflies in the summertime and in front of the twinkling lights of the pagoda in the wintertime it is a lovely place to spend some time, day or night. Our beautiful garden is open for visitors anytime, 24 hours a day, 7 days a week. Individual glass bricks can be inscribed with your own personal message to celebrate loved ones, or commemorate a special occasion and will remain in the Wall of Light for 10 years, from a date of your choosing. Discounted prices are £400, £280 or £200 depending on your chosen location. To benefit from this discounted price please make your order before 31st August 2018, and hurry because only a limited number of bricks are available at this price. To make your dedication please contact Nicola Winwood on 01429 855555 or visit Click Here and fill in your details and a member of the team will contact you to make arrangements.